The new iPhone has just been released and even though I don’t need a new phone, I can’t help but keep my eye on it. Such is my penchant for bright shiny new things. I’m sure I’m not alone. In fact, science tells us that our brains are hardwired to seek out novelty. No wonder then that the whole of Hong Kong is addicted to newness. New restaurants, new menus and new bubble tea shops that seem to warrant a queue from here to mainland China. And if there happens to be a famous face behind it, well, the queue just got longer. Demonstrating this with great vigour is the celebrity chef phenomenon that sees a plethora of new restaurants helmed by superstar cooks opening across the city. But what happens when the big name leaves, screaming (or rather excitable) fans disperse and the initial buzz dies down? If the kitchen is skilled and maintains the quality that the chef is famous for, then the food will speak for itself. British celebrity chef Gordon Ramsay. To find out if this was true, we ventured out to Tsim Sha Tsui’s Harbour City to taste test maze Grill by Gordon Ramsay, the chef known for his irritable temperament and passionate use of expletives. Born from another Dining Concepts partnership, the new restaurant is inspired by Manhattan’s best steakhouses and offers a wide selection of international rare-breed cuts of beef, as well as Asian-style dishes made exclusively for Hong Kong. We visit the restaurant after Ramsay has come and gone and, as expected, it’s already heaving with people. But first: Thanks to the mall’s very own maze, we spend 30 minutes weaving here and there and arrive late for our intended booking. What’s more, due to a miscommunication, it seems there was never a table reserved under our name to begin with. However, the staff are quick to rectify the situation and we are guided out to the open-air deck for cocktails while we wait for a table. Sweeping night views of the harbour make us forget the aforementioned mishap and with gin & tonic in hand, we happily wait to be seated. 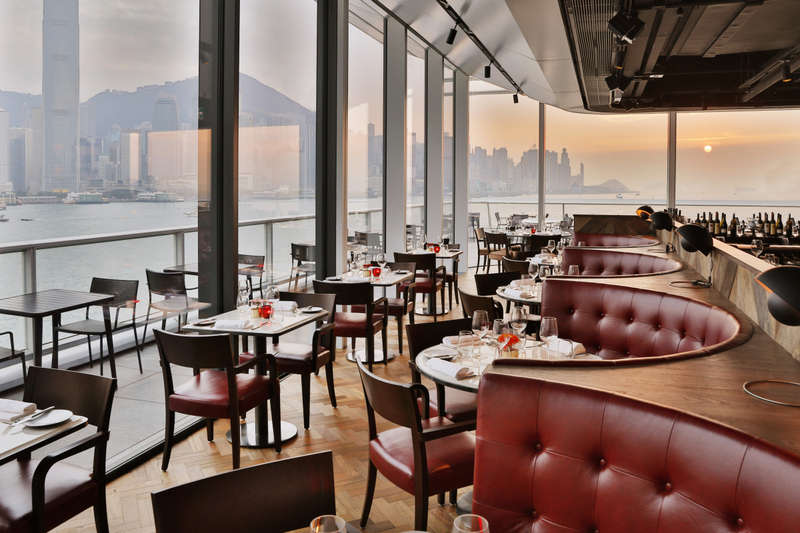 Sunset view at maze Grill by Gordon Ramsay in Harbour City. As we make our way to our table, the stunning glasshouse of a restaurant shows off its exceptional viewpoint once more, using the cityscape as the backdrop for the interior. New York-style features give the restaurant a more serious tone, with dark wood chairs and merlot-coloured leather booths completing the space. We’re greeted by Manchester-born Head Chef Gareth Packham, who suggests a few of his favourite menu items to try. Having worked with Ramsay for seven years, including two and half of those years at Bread Street Kitchen & Bar, he holds a confident air about him but remains modest. True to his Mancunian roots, the chef’s jovial disposition puts us in a great mood and we’re tingling with excitement as warm focaccia is brought to the table along with a decadent bone marrow butter. Our meal begins pleasantly with two balanced starters. Wagyu tataki is rich and tender with black truffle vinaigrette cutting through, while crunchy garlic chips add extra umami and crunch. The grilled diver scallops are plump and bouncy, dressed in a jalapeño and coriander sauce which adds a smoky kick to the seafood, while green apple and small crunchy tempura droplets complete the dish. Beef Wellington is the star of the show. We also sample dishes from the grill – the oven-grill hybrid called a Josper, to be exact – that cooks meat evenly while trapping the flavours inside. The chef-recommended rock lobster is indeed cooked perfectly. It’s lathered in a smoked shiso leaf butter which is fragrant but, unfortunately, lacked seasoning. The signature and very well publicised beef Wellington, however, is the star of the show. A slice reveals a glisteningly juicy fillet steak, coated in a layer of duxelles and wrapped in a buttery golden puff pastry. My knife cuts through it with ease and I add dollops of peppercorn sauce and creamy mashed potato until I’m stuffed and leave the smallest piece on my plate. But fear not for waste: the pastry is so moreish that my dinner date goes after the remnants for me. Sticky toffee pudding is a delicious conclusion to the meal. There is something so inherently comforting about British fare. Perhaps due to the grey and drab weather that often cloud the skies, the cuisine has become something of a pick-me-up, especially when it comes to dessert. An indulgent and gooey coconut & dark chocolate cremeux with passionfruit sorbet, candied walnuts and a brandy snap comes to the table and the flavours combine for an intense mouthful – definitely one for sharing. The warm sticky toffee pudding, meanwhile, is something you could devour on your own. Baked to the point where the edges are almost burnt, caramelised and crispy, the pudding bathes in treacle-like toffee sauce and is topped with vanilla ice cream. It’s a fantastic end to an evening, and I leave thinking that it’s true that new things will always be exciting, but there is also true comfort to be relished in things that feel familiar – and it is exactly those things that I’ll come back for. Perfect for: a group of friends (especially if you order the beef Wellington to share) and sunset cocktails with impressive views of the harbour. Hours: Open daily for all-day dining from 12:00 noon to 11:00pm.